Earlier this week a subway station in Washington DC turned into a surprise water park ride. It wasn’t a huge deal — the station was closed for a few hours, the water drained, and service went back to normal — but it certainly looked like it. Seeing a timelapse of the whole thing from the station’s entrance shows how this happened. Yes, there is definitely a hill, although it could be argued that the station is not at the bottom of that hill. But although the rainfall was especially heavy, it doesn’t seem that the situation itself was all that rare. Flooding has absolutely been an issue around the subway station for some time. 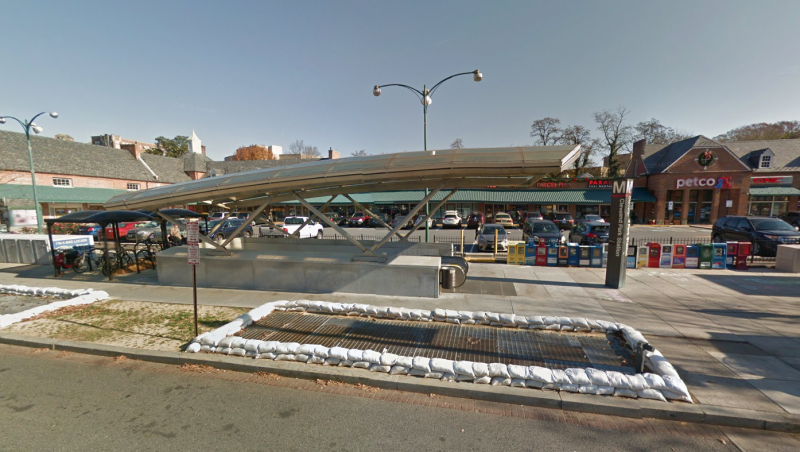 The Google Street View image of the Cleveland Park station, which was taken over six months ago in November 2015, shows sandbags ringing the sidewalk — a temporary solution for a known problem but not a permanent fix. DC is embarking upon an ambitious safety upgrade across its entire system that will require long-term closures for many lines. But that doesn’t include improvements to the streets and sidewalks around the station entrances, which Cleveland Park desperately needs before the next big storm.